Chris Lucas has a knack for nailing the Melbourne dining zeitgeist, and he’s done it again with Kong, a mod-Korean diner on Church Street, Richmond. While it might seem like he’s jumping on the kimchi bandwagon, I know this bad boy has been in the planning for more than a year, so Lucas and executive chef Benjamin Cooper must have cottoned on to the Korean theme a while back. Another hallmark of The Lucas Group’s eateries (think Chin Chin, Baby) are the on-trend fitouts. Here, there’s a Scandinavian simplicity to the light-filled space, with a pared-back aesthetic that borders on a school canteen vibe and a handful of cutesy details to keep things fresh. A banquette runs the length of one wall, communal tables crowd the centre, and a string of bar stools offer a front-row seat at the open kitchen. Perhaps it’s the postcode, but the waitstaff thankfully lack the hipper-than-thou attitude that can mar a meal at Chin Chin. They’re keen to talk us through the extensive menu, which spans snacky starters, roti rolls, ubiquitous bau, and barbecued meats from the Kong pit. We kick off with a couple of shochus topped with house-made soda (pomegranate and pink grapefruit; lemongrass and lime) before launching into the food. Our waiter warns us we may have over-ordered – and it turns out he was right. Within minutes our tiny table is covered in glazed ceramic plates. 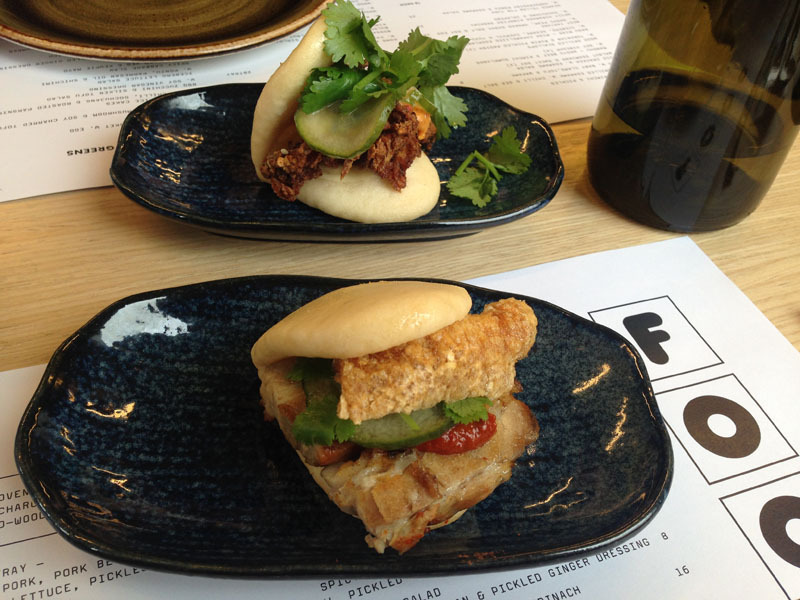 First up are the bau ($6 a pop), one filled with pork belly, crackling, pickled cucumber and Kong’s (could-be-hotter) ‘Crazy Horse Chilli’ , the other with soft-shell crab, coriander and a salted duck egg relish. The buns are that pillowy, chewy-soft texture, and the fillings are generous, but the pork definitely wins in the flavour stakes (the creamy, mayo-heavy egg relish drowns out the delicate crab). Next up are the chicken wings ($12), half a dozen fried wings covered in a sticky honey, sesame and soy glaze – the messy, meaty little morsels offer a clear nod to Melbourne’s original KFC (Korean Fried Chicken) at Gami Chicken & Beer. I’d recommend ordering these if you’re dining with a group… three wings apiece becomes a tad cloying. I take a breather between wings to try the nasu miso, squishy discs of caramelised, miso-doused eggplant, served on triangles of iceberg lettuce with a flurry of chervil fronds. It offers a moment of light respite between the full-on wings, but at $12 for four canape-sized bites, it provides the least bang for your buck. Our final course is the Bossam BBQ Tray, a bargain at $28. The metal tray is piled high with pulled pork, fatty beef brisket, pork belly with crackling and chilli-flecked chicken, served with cos lettuce leaves, pickles, kimchi and the house-made walnut ssamjang, a sweet, earthy relish. This is my kind of dining (I’ve written here before about how much I like to eat with my fingers), scooping up a bit of this and a dollop of that to create little parcels of smoky meats and zippy accompaniments. I could take or leave the dry chicken breast, but the pork belly with shards of crunchy crackling is on song. With all that’s come before it, we barely make a dent in the platter. Yes, we were warned. Considering we didn’t hold back, the $83 bill comes as a pleasant surprise. Kong delivers affordable, accessible food served with genuine enthusiasm. We’ll be back to work our way through the rest of the menu.